We report a case of blebitis that occurred 3 years later following a combined glaucoma and cataract surgery. It was an atypical presentation, as patient had no classical fiery looking signs of blebitis despite the isolated organism being Pseudomonas aeruginosa. Improvized surgical techniques like use of Mitomycin C, releasable flap sutures though considered as part of the recommended procedure for better surgical outcomes, their role as potential risk factors for visually blinding complications like endophthalmitis are often overlooked. This case report throws light on such risk factors for bleb associated infections and recommends removal or trimming of all releasable sutures and the need for a regular postoperative follow-up. Combined trabeculectomy and cataract surgery are widely done to combat glaucoma and the visual disability induced by cataract simultaneously. There have been several modifications in the surgical technique over years to enhance the surgical outcome of the procedure and at the same time to reduce the associated complications. 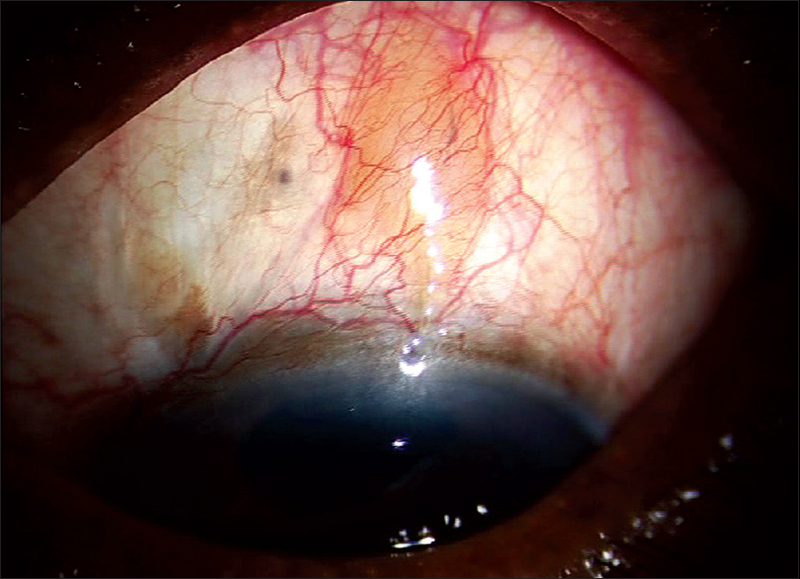 Bleb associated infections are one of the dreaded complications following trabeculectomy, and blebitis itself is alarming because of its high risk of intraocular spread and endophthalmitis. A 69-year-old female presented with the complaints of headache and pain in the left eye of one month duration. She was a known patient of unilateral pseudoexfoliation glaucoma, who underwent manual small incision cataract surgery with Mitomycin C (0.2 mg/ml for 2 min) augmented trabeculectomy in her left eye. 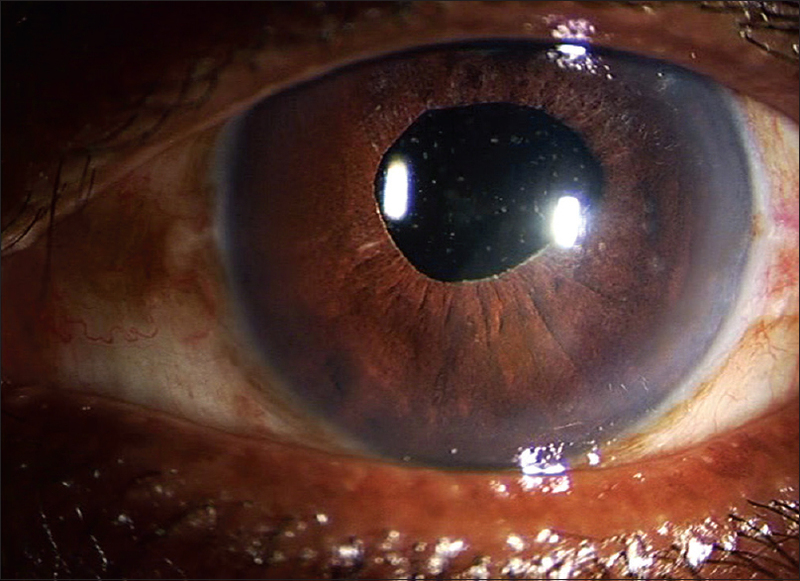 It was a single site combined surgery in the superior quadrant of the eye, with a fornix based conjunctival flap and a single releasable 10-0 nylon suture anchoring the scleral flap using a modified (first bite in peripheral cornea) Kolker's technique. Surgery was performed 3 years back and she lost to follow-up after 1 month of surgery. At present, she had no history of diminution of vision or trauma to the left eye and was not a diabetic. 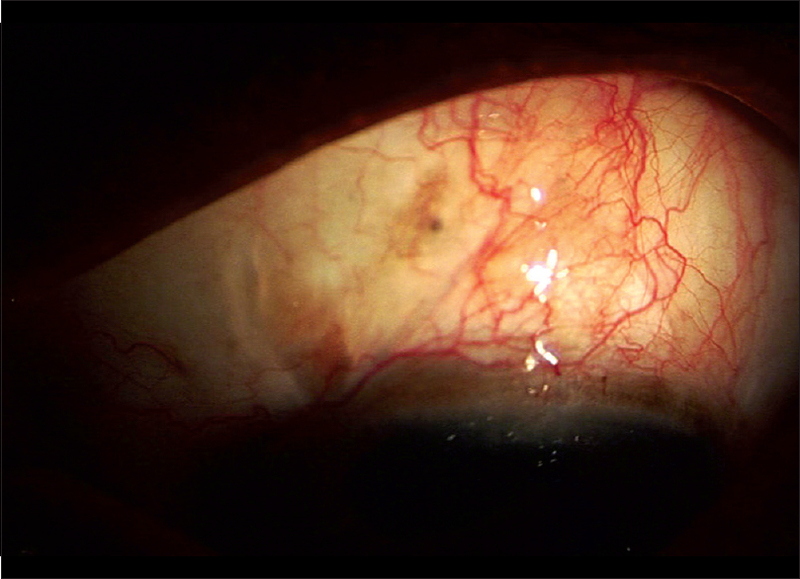 The patient was pseudophakic in the right eye. Best corrected visual acuity was 20/30 in both eyes. Anterior segment examination of the right eye showed pseudoexfoliation material on the pupillary ruff with posterior chamber intraocular lens in the bag and the left eye showed clear cornea with a releasable suture, a low noncystic bleb with an elevated area and congestion overlying it, normal anterior chamber with pseudoexfoliative material on the pupillary ruff and a posterior chamber intraocular lens in the bag [Figure 1]. The intraocular pressure was 12 mmHg in both eyes and fundus examination showed a cup disc ratio of 0.4 with healthy neuroretinal rim in the right eye and 0.9 with bipolar notch in the left eye and age related macular degeneration changes in both eyes. The releasable suture in the left eye had mucus debris and the bleb showed collection of pus [Figure 2]. On gonioscopy, ostium was free and posterior segment examination showed no signs of vitritis. Nasolacrimal duct of both sides were free of infection and patient's random blood sugar was within the normal limits. The releasable suture was removed and inoculated in blood agar and the collection of pus was expressed out along the same suture tract [Figure 3]. The patient was started empirically on oral Ciprofloxacin 500 mg twice daily for 5 days and topical 5% Cefotaxime and 2% Amikacin eye drops hourly. The blood agar culture report revealed growth of Pseudomonas aeruginosa sensitive to the above antibiotics and hence the patient was advised to continue the same medications. After a week, the patient was symptomatically better, but on examination, we noticed a small recollection of pus in the bleb area [Figure 4]. The collection was again expressed and inoculated in blood agar and the patient was continued on the same topical antibiotics. The repeat culture report also revealed growth of P. aeruginosa. After 3 days and her last review visit, her left eye best corrected visual acuity was 20/30, the eye was quiet with a low bleb devoid of collection and ostium free of infection. Intraocular pressure was 10 mmHg and posterior segment continued to be free of infection. Combined trabeculectomy and manual small incision cataract surgery is a popular technique in our institution for managing cataract and glaucoma simultaneously since it offers an equally effective alternative to phacotrabeculectomy. The procedure does not require expensive automated equipment and can be done with minimal of instrumentation. For such reasons patients in the lower socioeconomic status prefer this procedure over more advanced surgical technique. This case report attempts to highlight the fact that regular follow-up should be emphasized to patients undergoing small incision cataract surgery with trabeculectomy, which can also be done by a local ophthalmologist if the patient is from afar. We recommend that the releasable suture should be removed in all patients and if a decision is taken that removal of the suture is not required then the suture should at least be cut flush with the limbus, so that it retracts into the bleb and there is no track connecting the exterior of the eye to the filtering bleb. A regular long-term postoperative follow-up is very crucial following trabeculectomy, as it plays a major role in bleb survival and in preventing or detecting its complications at the earliest. 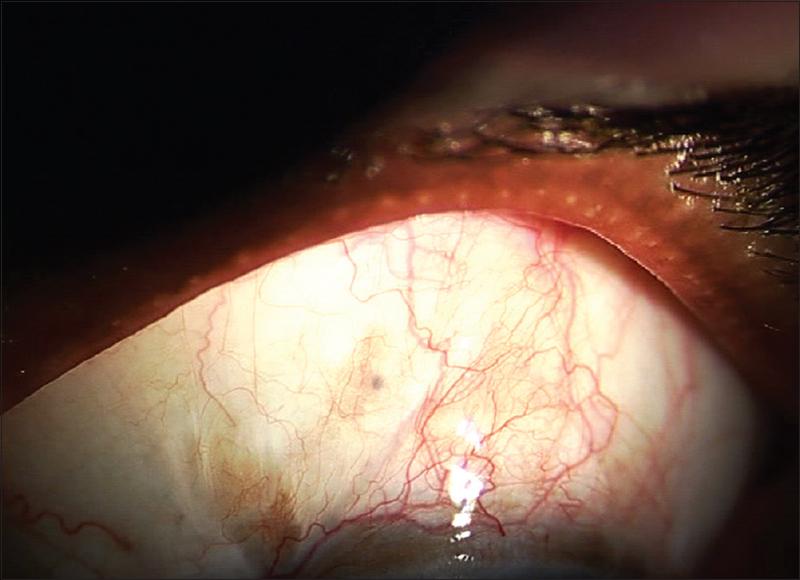 Ramakrishnan R, Bharathi MJ, Maheshwari D, Mohideen PM, Khurana M, Shivakumar C. Etiology and epidemiological analysis of glaucoma-filtering bleb infections in a tertiary eye care hospital in South India. Indian J Ophthalmol 2011;59:445-53. Jacobs DJ, Leng T, Flynn HW Jr, Shi W, Miller D, Gedde SJ. Delayed-onset bleb-associated endophthalmitis: Presentation and outcome by culture result. Clin Ophthalmol 2011;5:739-44. Rai P, Kotecha A, Kaltsos K, Ruddle JB, Murdoch IE, Bunce C, et al. Changing trends in the incidence of bleb-related infection in trabeculectomy. Br J Ophthalmol 2012;96:971-5. DeBry PW, Perkins TW, Heatley G, Kaufman P, Brumback LC. Incidence of late-onset bleb-related complications following trabeculectomy with mitomycin. Arch Ophthalmol 2002;120:297-300. Thomas R, Jacob P, Braganza A, Mermoud A, Muliyil J. Releasable suture technique for trabeculectomy. Indian J Ophthalmol 1997;45:37-41. Tezel G, Kolker AE, Kass MA, Wax MB. Late removal of releasable sutures after trabeculectomy or combined trabeculectomy with cataract extraction supplemented with antifibrotics. J Glaucoma 1998;7:75-81.